Traumatic abdominal wall hernias (TAWHs) are relatively uncommon entities that are being reported with increasing frequencies in the current literature. Common mechanism that predispose to such hernias include motor vehicle accidents, seatbelt injuries, fall, handle-bar injuries, bullfighting, and fall of heavy objects. Bullhorn injury leading to TAWH is a rare mechanism. A bull is an intact (i.e., non-castrated) adult male of the species Bos taurus (cattle), identified as B. taurus indicus or Bos primigenius in the Indian context and B. taurus taurus or B. taurus ibericus in Spanish bullfighting context. They are known to be more muscular and have aggressive behavior than their female counterparts, i.e., cow. Bullhorn-injury associated traumatic hernia (BATH) occurs as a result of a direct blow to the abdominal wall by the blunt horn of a bull (and related animals that include cow, ox, buffalo, and bison), which compromises the integrity of the muscles and fascia and leads to hernia formation. Only 12 such previously reported cases were found during our literature review of English, Spanish, Portuguese, and French language medical literature search. A comprehensive online English, Spanish, Portuguese, and French language medical literature search was done using various electronic search databases including the following: “Medline,” “PubMed,” “Embase,” “Scopus,” “Web of Science,” “Google Scholar,” “ScienceDirect,” “Ovid,” “Fuente Académica,” “Global Index Medicus,” “Index Medicus for South-East Asia Region (IMSEAR),” “IndMED,” “scientific electronic library online (SciELO),” and “Latin American and Caribbean Literature on Health Sciences.” Different search terms related to bullhorn associated injuries (in English as well as above-mentioned languages) were used either alone or in combination (with “and,” “or”) such as “bullhorn injuries,” “bullhorn injury associated hernia,” “bullhorn-injury associated abdominal hernia,” “traumatic hernias associated with animals,” “bullhorn-related traumatic hernias,” “mechanism of TAWHs,” “sheathed goring,” “cow horn injury,” “bison horn injury,” “ox horn injuries,” and “goring injuries.” An advanced search was also carried out by combining all search fields in keywords, abstracts, and/or titles. The start date in the advanced search was kept on January 1, 1980, while the end date was October 31, 2017. Using these search terms, appropriate articles were selected for a comprehensive review. Investigation of literature was further supplemented by searching the referenced articles created by original investigators. Finally, all the selected articles were confirmed for duplications and excluded if it was observed. Google® translation service was used for translating the texts of other languages into English, and further help was taken from the Department of Linguistics, Banaras Hindu University (BHU) for proofreading and in case of any ambiguity. The outcome measures which were studied included the presentation time after injury, clinical examination findings, associated injuries, imaging findings, timing and method of operative intervention, and intra-operative findings. Only 12 such previously reported cases were found during our literature review, which met the inclusion criteria mentioned above – five as case reports,,,,, three cases as part of case series on blunt abdominal trauma,,, one case as letter to editor, two more cases as part of discussion on bullfight-associated injuries in Spain,,, and one case as a teaching case in online radiologic teaching file. Various relevant aspects of these cases have been discussed in detail in the following discussion. 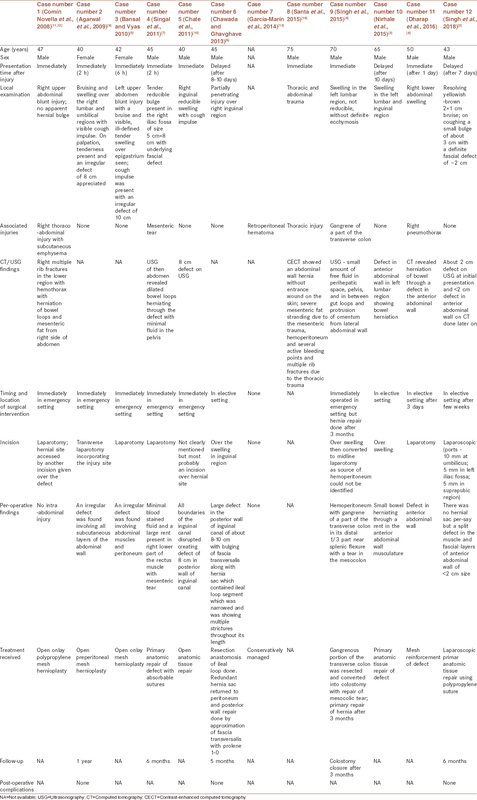 The comparative description of all these cases has been compiled in [Table 1]. We, thus, present here the first most comprehensive discussion of all such cases reported in the literature. BATH is a rather uncommon mechanism leading to TAWH. Injuries caused by the horn of a cow, bull, buffalo, ox, or bison would all constitute a bullhorn injury for all practical purposes; however, injuries due to the horn of a bull are the most commonly described form of horn injuries. Only 12 such previously reported cases were found during our literature review,,,,,,,,,,,, which have been summarized in [Table 1]. Very interestingly, most of the described incidents are from the Indian subcontinent. We were expecting a lot of reports from the Spanish, Portuguese, and French literature. However, despite the presence of several studies describing bullhorn injuries in the above-mentioned literatures,,,, there were hardly any reported cases of TAWH., Martínez-Ramos et al. have described 387 cases related to bullhorn wounds, but there was no case describing TAWH. Similarly, Ríos-Pacheco et al. have described their 1-year experience of dealing with cases of bullhorn injuries; however, no case of TAWH was described in there study. Most of the described cases related to injuries inflicted by bull were penetrating injuries in various parts of the body. This basic difference in the nature of bullhorn-inflicted injuries leading to high chances of BATH in the Indian subcontinent as compared to bullfighting regions of the world may be explained by the characteristics of the bull found in these regions. B. taurus indicus or B. primigenius found in the Indian subcontinent has more vertical and blunt horns as compared to the relatively horizontal and sharp horns of Spanish fighting bull, i.e., B. taurus taurus/ibericus [Figure 1]. This leads to more penetrating injuries in bullfighting context, and that explains the relative paucity of literature related to BATH in bullfighting regions of the world. Wood et al. classified TAWH in three major types: Type I is sustained from high energy injuries and are commonly associated with intra-abdominal injuries. Type II occurs due to low-energy injuries example include handle-bar hernias. Type III results from deceleration injuries and is associated with intra-abdominal herniation. BATH cases can also be classified into high- and low-energy impact cases. In general, the cases with higher impact, especially when the patient was thrown away by a speeding bull, presented earlier,,,,,,, and may be associated with other injuries as well.,,, Low-impact injuries would be isolated injuries presenting late.,, For example, in the case reported by Singh et al., the patient was hit by a standing bull, and he fell down on the ground and thus constitutes a low-impact type injury. Had the bull been charging toward the person hitting with force, as occurs in bullfights,,, the injury may be considered a high-impact injury, and the possibility of associated injuries is high. Another possible mechanism of high-impact bullhorn injury is being held by the bull in his horn and then being thrown away on to the ground or against a wall, but this mechanism might not cause the classically described BATH. In such a scenario, the probability of other forms of traumatic injuries is higher. All reported cases of BATH were middle- to old-aged males except the cases reported by Agrawal et al. and Bansal and Vyas who were middle-aged females. The presentation in a case of TAWH caused by bullhorn that is, BATH includes pain, erythema, abrasion, bruising, laceration, bleeding, or swelling (apparent or on coughing) at the injury site. In case of injury to intra-abdominal viscera, a patient presenting immediately may present without features of peritonitis as in the case reported by Singal et al. BATH may also present as a tender palpable lump with ecchymosis and contusion of overlying skin., Presentation in such cases may be early (especially in high impact injuries) or delayed. BATH may be associated with extra-abdominal injuries such as pelvic, lumber, and rib fractures when significant kinetic energy is involved. Location of hernial defects was in iliac fossa, inguinal region, and lumbar region. In TAWHs, herniation is most commonly described at anatomically weak points due to blowout near iliac crest (lumbar), inguinal region, or lateral to rectus muscle away from the site of primary impact. Tension of abdominal musculature between pelvic bones increases the potential for disruption in the right lower abdomen lateral to rectus muscle through oblique and transverse muscle after blunt abdominal trauma. A combination of a sudden increase in intra-abdominal pressure and powerful shear forces applied to the abdominal wall leads to TAWH. The following mechanism describes the development and location of BATHs as well except that the area and time of impact are smaller. High index of clinical suspicion is essential in all case of bullhorn abdominal injury as an accompanying hematoma often compounds the diagnosis. USG is the initial investigation most commonly employed, especially in emergency settings. It will tell about us the size of hernial defect, contents of hernial sac, presence of hemoperitoneum, and to some extent, the presence of other solid organ injuries. 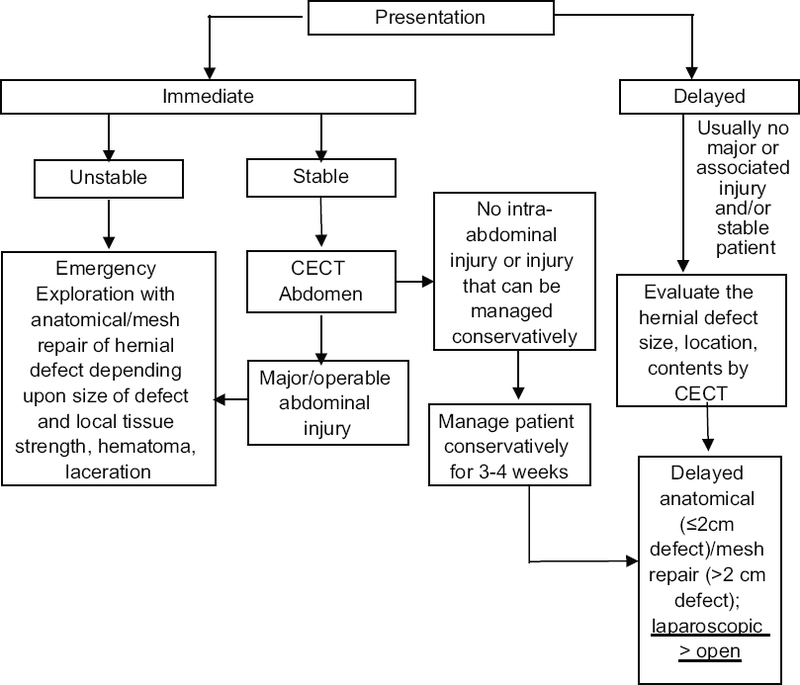 However, contrast-enhanced computed tomography (CECT) abdomen is the recommended investigation in all such patients even in emergency setting as hernial defect and associated injuries are identified, defined, and described with reliable sensitivity and specificity. It also tells us about the degree of disruption of abdominal wall and helps differentiate an underlying hematoma from a hernia. With the advent and availability of advanced imaging techniques in emergency setting at most tertiary centers, we recommend using CECT abdomen, in all stable BATH cases presenting immediately, for initial evaluation. As shown in [Table 1], in five cases, a USG was employed, and in the other two cases, a CECT was used as a post-operative diagnostic modality. Netto et al. in their retrospective review of 34 patients with TAWH had made three recommendations. First, mechanism of injury should be the deciding factor whether a patient with TAWH (with high energy) needs an urgent laparotomy. Second, clinically apparent hernia appears to have a high rate of associated injuries and need urgent laparotomy. Third, occult TAWH diagnosed only by CT scan may not require immediate laparotomy or hernia repair. The same principles seem to be valid for BATH cases as well. With the advent of technology, three-dimensional reconstruction of CT films is available post-operatively which can accurately quantify the size of abdominal cavity, hernial sac, and thus, helps in predicting the required mesh size.,,, It helps in cases planned for elective mesh repair. This technique is very useful for accurate diagnosis and differential diagnosis. However, the technology has some limitations that it is not available at all the centers, it may be difficult to employ it in emergency settings, and finally, it will have a limited role if primary tissue repair is planned as in the case reported by Singh et al. An algorithm has been made for the management of such cases, after reviewing recent literature on the management of TAWH and BATH, and has been presented in [Figure 2]. This algorithm can also be applied to cases of TAWH. In immediately presenting stable patients with a small hernial defect or occult hernial defect only demonstrable on CT scan, an initial conservative approach can be a valid entity. Although Singal et al. and Chate et al. have gone for immediate repair in their cases. In unstable patients or patients with injuries requiring operative intervention such as in the case of Singh et al., emergent laparotomy is the only option. In case of any major or operable intra-abdominal injury, patients must undergo immediate exploratory laparotomy with repair of hernial defect anatomically as in case of Singal et al. or using a mesh in the same sitting. However, in the case of Singh et al., repair of hernial defect was not done at the initial laparotomy rather it was done as an anatomical repair 3 months later along with colostomy closure. No reason has been mentioned regarding this odd choice, but a possible explanation may be that the local tissue might been injured in such a way that it precluded any immediate repair. In stable patients, not requiring any immediate surgical intervention and having small hernial defect on CT in the absence of any associated injury, we found that going for a delayed repair after few weeks appears to be a wise choice because it gives time for resolution of local edema, hematoma, and inflammation as described by Singh et al. Chate et al. have chosen to repair the 8 cm defect in the right inguinal region immediately. In delayed presentations, usually, there is no associated injuries and patient is stable. Regarding incision in cases of open hernioplasty in BATH, an incision over hernia swelling in elective cases delayed cases, and selected cases in emergency setting (with no other suspected injury on pre-operative imaging), remains a favored option. It appears to be a logical decision to go for a local incision over hernial site for repairing the defect if open hernioplasty is planned in elective setting. Even if any associated injury is suspected on CECT, a diagnostic laparoscopy followed by a laparoscopic or open repair is a wise move. We found it odd that Dharap et al. went for laparotomy in elective setting even after having done a CT scan. Issues related to the availability of technical expertise in laparoscopy might be a possible explanation. A diagnostic laparoscopy for any suspected injury followed by laparoscopic or open hernia repair by an incision over swelling would have been a better decision under the mentioned circumstances. Only Dharap et al., who had done repair in elective setting has used mesh for repair. Nirhale et al. have also operated the patient in elective setting, but he has chosen for anatomic repair. Other authors have operated the patient in the emergency setting and have gone for the more common notion of avoiding mesh and doing the anatomic repair., We also avoid mesh in emergency settings. However, Comín Novella et al., Agarwal et al. and Bansal and Vyas have gone for a mesh repair in an emergency setting. García-Marín et al. have shown that the patient was managed conservatively, but they have not mentioned the follow-up so the patient might have undergone hernioplasty later on. There has been an ongoing debate regarding the timing of repair, that is, early versus delayed repair of TAWHs.,, Early repair has been the most commonly reported entity in literature, and its proponents say that with delayed repair defects may enlarge, muscle may undergo disuse atrophy, primary approximation may become difficult and other injuries may be missed. However, more recently, delayed repairs of TAWHs in stable patients have been reported with optimal outcomes.,, Singh et al. have described a clean hernial defect with no tissue edema or inflammation peroperatively on delayed repair, due to which laparoscopic anatomic repair of defect was done very easily. This fact is further reinforced by the case reported by Singh et al., as the authors did not repair the hernial defect at initial operation even though they started the operation by an incision over the defect and then converted it into a midline laparotomy. Only logical explanation appears to be poor condition of tissue locally (possible laceration/shattering) and contamination which precluded any immediate repair. We strongly advocate going for an interval elective repair of small hernial defects in stable patients but within a few weeks, as this gives time for local tissue edema and inflammation to subside off and fibrosis to set in. Very small defects can heal off over due course of time and size of defects might reduce as occurred with the case described by Singh et al. Laparoscopic repair of TAWH has been described with reliable repair of defects and optimal outcome, but in almost, all cases mesh repair was the preferred option.,, Singh et al. have described a case where they have successfully used laparoscopic anatomic tissue repair with nonabsorbable suture and is the first case of BATH employing principles of laparoscopy. Finally, there is no documented complication following BATH repair at present, but this may be due to a lack of long-term follow-up. Honaker et al. reported a recurrence rate of 8.3% in 38 cases of TAWH, with all the recurrences occurring in patients undergoing immediate repair. Similarly, Coleman et al. have reported a recurrence rate of 26% for TAWH, in his case, series of 80 patients with acute repair being associated with the majority of the recurrences. Even Damschen et al. recognized that immediate surgery does not prevent late sequelae. This again reinforces the concept of relatively delayed repair in stable patients with small defect and delayed presentation. Bullhorn injury is an uncommon mechanism of the development of TAWH and may present immediately or as delayed presentation. Patients presenting late but with stable vitals and small hernial defects can be managed by delayed elective hernial defect repair and utilizing laparoscopic principles is a valid and feasible option. In the present era of minimal access surgery, if facilities and expertise permit, laparoscopic principles must be utilized in emergency as well as elective settings for the management of TAWHs and BATHs for the optimal patient outcome and to minimize post-operative morbidity. We would like to thank the Department of Linguistics, BHU, Varanasi who helped in language translation. Suhardja TS, Atalla MA, Rozen WM. Complete abdominal wall disruption with herniation following blunt injury: Case report and review of the literature. Int Surg 2015;100:531-9. Singh KD, Singh V, Gupta P, Mani R. A rare case of bullhorn-injury associated traumatic hernia of anterior abdominal wall managed by laparoscopic sutured tissue-only repair. J Postgrad Med 2018;64:56-8. Nirhale D, Athavale V, Bhatia M, Tomar V. Silent traumatic hernia. Sudan Med Monit 2015;10:137-9. Singh B, Kumar A, Kaur A, Singla RL. Bullhorn hernia: A rare traumatic abdominal wall hernia. Niger J Surg 2015;21:63-5. Bansal S, Vyas KC. Traumatic abdominal wall hernia: A case report. Indian J Surg 2015;77:193-4. Chawada M, Ghavghave U. Acute direct inguinal hernia resulting from penetrating abdominal Trauma: Case report. Int J Recent Trends Sci Technol 2013;5:130-1. Singal R, Dalal U, Dalal AK, Attri AK, Gupta R, Gupta A, et al. Traumatic anterior abdominal wall hernia: A report of three rare cases. J Emerg Trauma Shock 2011;4:142-5. Dharap SB, Noronha J, Kumar V. Laparotomy for blunt abdominal trauma-some uncommon indications. J Emerg Trauma Shock 2016;9:32-6. Agarwal N, Kumar S, Joshi MK, Sharma MS. Traumatic abdominal wall hernia in two adults: A case series. J Med Case Rep 2009;3:7324. Chate N, Deshmukh S, Dange A. Inguinal hernia resulting from bull horn injury. ANZ J Surg 2011;81:943. Comín Novella L, del Val Gil JM, Moreno Muzas C, Oset García M. The bull: The great danger of summer festivals. Cir Esp 2008;83:215. Martínez-Ramos D, Manuel Miralles-Tena J, Rivadulla-Serrano I, Luis Salvador-Sanchis J. Traumatic hernia due to a bull horn or sheathed thrust? Cir Esp 2009;85:64. García-Marín A, Turégano-Fuentes F, Sánchez-Arteaga A, Franco-Herrera R, Simón-Adiego C, Sanz-Sánchez M, et al. Bullhorn and bullfighting injuries. Eur J Trauma Emerg Surg 2014;40:687-91. Santa LJ, Mesón IM, Retortillo JA, Miguel AC, Liza LN, Ángel JM. Sheathed Goring: An Unusual Mechanism of Trauma. Available from: http://www.eurorad.org/case.php?id=13019. [Last accessed on 2017 Aug 05]. Selby CD. Direct abdominal hernia of traumatic origin. J Am Med Assoc 1906;47:1485-6. Dimyan W, Robb J, MacKay C. Handlebar hernia. J Trauma 1980;20:812-3. Ganchi PA, Orgill DP. Autopenetrating hernia: A novel form of traumatic abdominal wall hernia – Case report and review of the literature. J Trauma 1996;41:1064-6. Damschen DD, Landercasper J, Cogbill TH, Stolee RT. Acute traumatic abdominal hernia: Case reports. J Trauma 1994;36:273-6. Sheldon KJ, Deboy G, Field WE, Albright JL. Bull-related incidents: Their prevalence and nature. J Agromedicine 2009;14:357-69. Ríos-Pacheco M, Pacheco-Guzmán R, Padrón-Arredondo G. Bull horn wounds. A 1 year experience at the O'horán general hospital Mérida, Yucatán, México. Cir Cir 2003;71:55-60. Martínez-Ramos D, Miralles-Tena JM, Escrig-Sos J, Traver-Martínez G, Cisneros-Reig I, Salvador-Sanchís JL, et al. Bull horn wounds in castellon general hospital. A study of 387 patients. Cir Esp 2006;80:16-22. Wood RJ, Ney AL, Bubrick MP. Traumatic abdominal hernia: A case report and review of the literature. Am Surg 1988;54:648-51. Netto FA, Hamilton P, Rizoli SB, Nascimento B Jr., Brenneman FD, Tien H, et al. Traumatic abdominal wall hernia: Epidemiology and clinical implications. J Trauma 2006;61:1058-61. Yao S, Li JY, Liu FD, Pei LJ. Significance of measurements of herniary area and volume and abdominal cavity volume in the treatment of incisional hernia: Application of CT 3D reconstruction in 17 cases. Comput Aided Surg 2012;17:40-5. Xu Z, Asman AJ, Baucom RB, Abramson RG, Poulose BK, Landman BA, et al. Quantitative CT imaging of ventral hernias: Preliminary validation of an anatomical labeling protocol. PLoS One 2015;10:e0141671. Blair LJ, Ross SW, Huntington CR, Watkins JD, Prasad T, Lincourt AE, et al. Computed tomographic measurements predict component separation in ventral hernia repair. J Surg Res 2015;199:420-7. Allen WM, Xu Z, Asman AJ, Poulose BK, Landman BA. Quantitative anatomical labeling of the anterior abdominal wall. Proc SPIE Int Soc Opt Eng 2013;8673:867312. Akbaba S, Gündoğdu RH, Temel H, Oduncu M. Traumatic abdominal wall hernia: Early or delayed repair? Indian J Surg 2015;77:963-6. Bathla L, Davies E, Fitzgibbons RJ Jr., Cemaj S. Timing of traumatic lumbar hernia repair: Is delayed repair safe? Report of two cases and review of the literature. Hernia 2011;15:205-9. Sall I, El Kaoui H, Bouchentouf SM, Ait Ali A, Bounaim A, Hajjouji A, et al. Delayed repair for traumatic abdominal wall hernia: Is it safe? Hernia 2009;13:447-9. Yadav S, Jain SK, Arora JK, Sharma P, Sharma A, Bhagwan J, et al. Traumatic abdominal wall hernia: Delayed repair: Advantageous or taxing. Int J Surg Case Rep 2013;4:36-9. Wilson KL, Davis MK, Rosser JC Jr. A traumatic abdominal wall hernia repair: A laparoscopic approach. JSLS 2012;16:287-91. Hiroshige S, Kubo N, Orita H, Saeki H, Kawanaka H, Tomikawa M, et al. Successful laparoscopic repair of delayed traumatic abdominal wall hernia. Fukuoka Igaku Zasshi 2013;104:595-8. Munshi IA, Ravi SP, Earle DB. Laparoscopic repair of blunt traumatic anterior abdominal wall hernia. JSLS 2002;6:385-8. Honaker D, Green J. Blunt traumatic abdominal wall hernias: Associated injuries and optimal timing and method of repair. J Trauma Acute Care Surg 2014;77:701-4. Coleman JJ, Fitz EK, Zarzaur BL, Steenburg SD, Brewer BL, Reed RL, et al. Traumatic abdominal wall hernias: Location matters. J Trauma Acute Care Surg 2016;80:390-6.